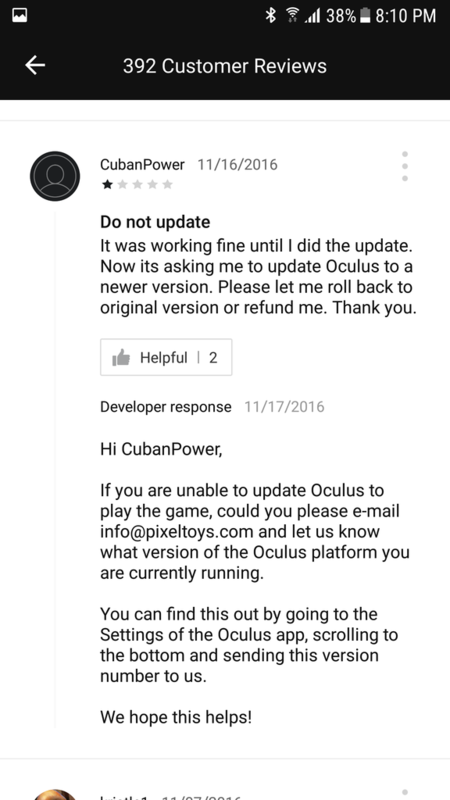 Our game has been recently released on Oculus Store, and now the game has about 10% comments stating that the game fails to start because of the message about Oculus update. Also, as judged by feedback, other developers face similar difficulties too. Could you, please, tell if there is any solution for this issue? Can we help with this one way or another, or should we integrate something into our game to get rid of this error? If we can’t, then are you going to solve this problem (maybe, to add into the update window a corresponding text about enabling Facebook App Manager and Facebook App Installer)? Thanks for reaching out and reporting this. I've compiled these reviews which you have reported, and have escalated this internally. If there is more relevant information that you can provide, including other developers who are experiencing this, please let me know and I will pass those details along accordingly. 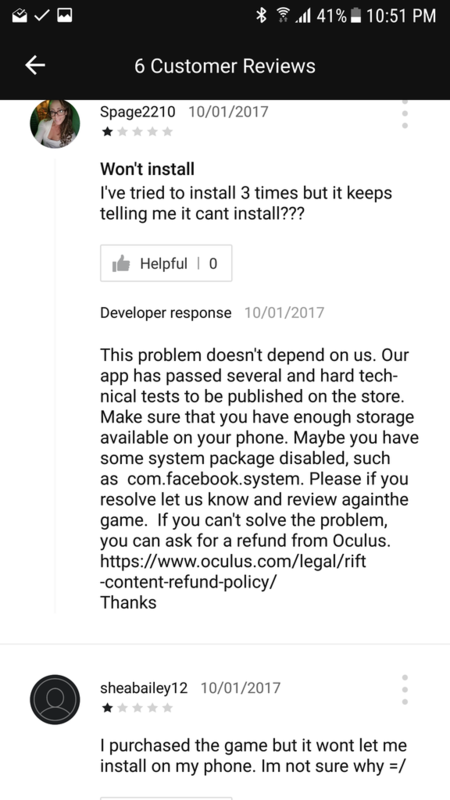 During the short period of time that our game is available on Oculus Store, we faced several types of problems of our users. 3. The game doesn’t start after the install. We think that the reason for occurrence of this issue and its solution is the same, and this is that it’s necessary to update the device to the latest version of Oculus. Probably, there is used the newer version of Oculus in our game than the version installed on a user’s device. I.e. they updated Oculus to the latest version and everything started to work. 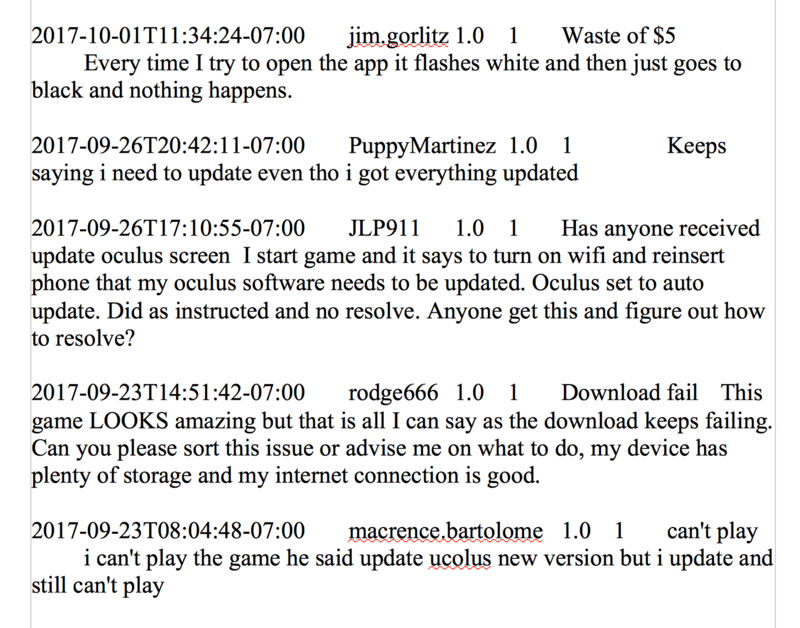 The confirmation of this can be found in our comments (see the attachments), or I can send (post) the part of communication with our users (exclusive of their identification), they confirm that everything started to work after Oculus updating. We couldn’t reproduce this situation on S6/S7/S8. Probably, the version of Oculus is already updated. We also saw the problems with installing and running in the recently released game Doors of Silence and with the game Wands existing quite a while as well. 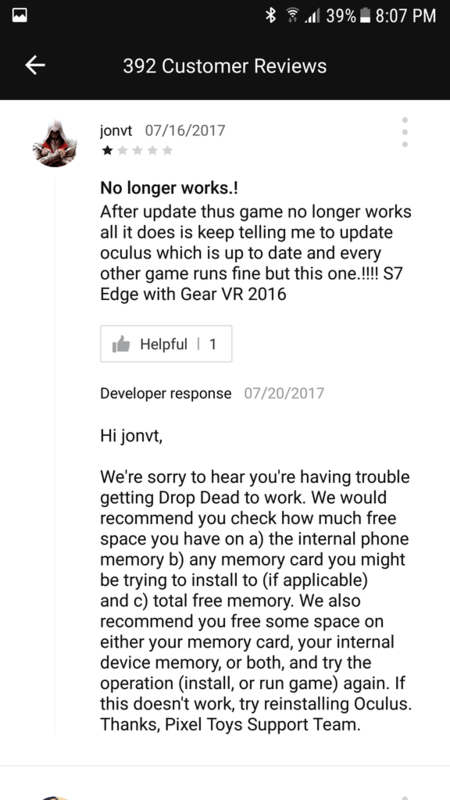 Also, the game Drop Dead has negative feedback related to impossibility to update Oculus too. At the moment, all we can do is send this instruction or offer the users to make a Refund. 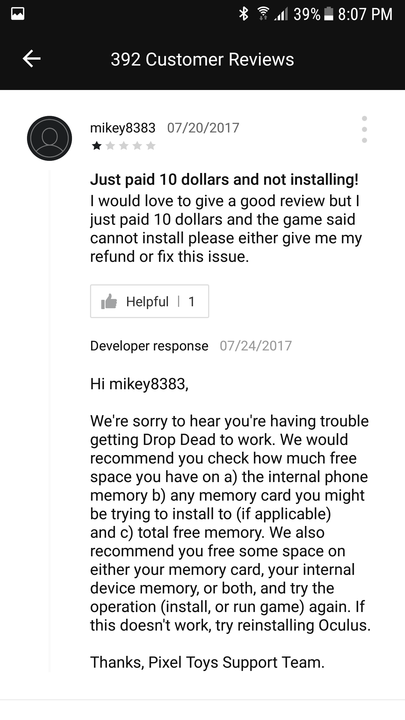 By the way, could you please tell, if a user makes a refund does his comment remain or is it removed? We want to help to solve this issue so that all parties were at an advantage. If you need any additional information from us or if you have any additional questions, please, let us know.